I was wondering if anyone could help me out here a bit. I'm looking to buy a compact camera which would fit in my pocket for my travels. I don't want to drag my dslr kit everywhere, mainly as it annoys my wife quite a bit. The thing is we have conflicting requirements and was wondering if there is a middle ground. Ideally I'd like a high aperture lens with a big sensor which generally means restricted zoom (about 3 - 4X) while my wife wants a camera that will zoom quite a bit which means reduced quality. I was wondering if anyone could recommend a compact which would fit both purposes. So not a 30X zoom but may be 7-10x zoom with as high an aperture as possible. Also should be good for low light photography. My ideal camera would be the RX100 but it doesn't fit the brief and is a bit expensive. My point-and-click is a Canon S95, and I love it. It's the best "pocket camera" I've ever owned. I have lots of control over things like WB, ISO, etc., and if you don't want to mess with all of that, it takes fine shots in P mode too. Also pretty inexpensive. I think nowadays the latest in this line is the Canon S100--it's 12 MP, takes 1080P video, 5x zoom, and $300 on Amazon. I'm a Nikon guy for DSLRs, but I'd take this Canon point-and-click over any compact camera Nikon has. Happy hunting! Message edited by author 2013-06-25 06:42:48. I have been looking at the Conon s110. The issue I (rather my wife)will have with this is the lack of a sweep panorama function. Other than that this would be perfect. +1 for the S95. I really loved mine but foolishly allowed my 2 year old daughter to use it and it suffered the consequences. The f/2.0 lens and a really good IS system make even night shots a hand-held proposition. Message edited by author 2013-06-25 10:45:19. Panasonic Lumix LX5/LX7 are fantastic. The 5 is a f/2.0 lens, the is f/1.4, plus some other incremental changes. They do pano. Variable aspect ratio feature is terrific. IQ is stellar. Zoom's not quite as much as you are talking about though. We have had an LX3 for a while, Penny's compact, and I joined the bandwagon with an LX5. I have the S100 and it's my go-to travel camera. I can't recommend it highly enough. The RX100 blows away pocket cameras with small or even the larger compact sensors. Up to ISO 400, I'd say it's on par with APS-C and Micro-4/3, even though smaller. See this thread, I posted some comparisons and my opinion. It's expensive, but built like a tank (all metal). Zoom is only 27-100 or so, though. But there's an extended zoom mode, better than digital zoom, and in JPEG mode you can zoom to 200. Not really good at 100%, but surprisingly good when looking at resized images. In other words, you are not going to crop further. Sony's sweep panorama is a fantastic plus. 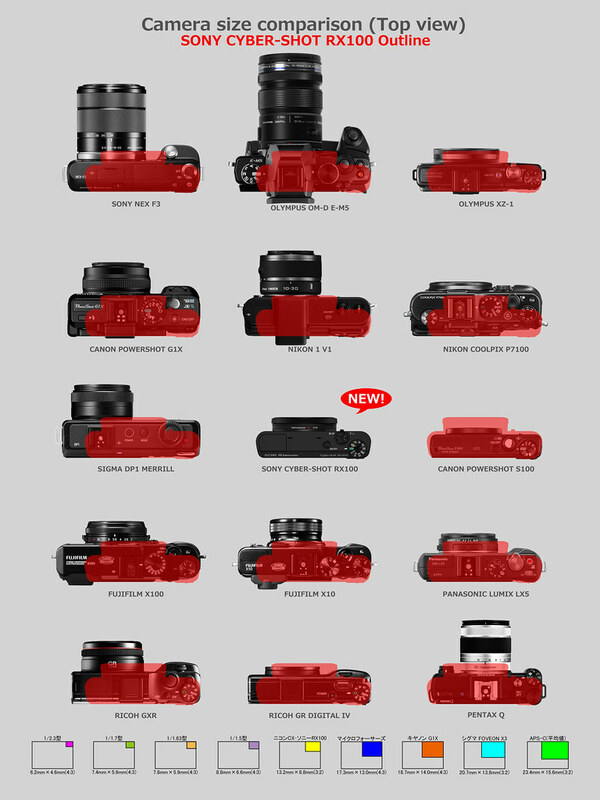 Use the comparometer to compare these various cameras and decide for yourself. If it can fit in a coat pocket. I think the Micro-4/3 cameras like the Oly OM-D and the Fuji's are worth a look as well. Message edited by author 2013-06-25 12:47:22. Compact camera with a full frame sensor! Let's not forget about the mirrorless stuff like the EOS-M.. Except, my S95 really fits in my pocket comfortably. Do any of the other ones? Even the G1X is stupidly big for a pocket. ETA: As Spork said right before me. Message edited by author 2013-06-25 13:18:19. Hmm.. I'm thinking someone is either very very stupid, or incredibly smart. Those are hideous - but if they've got a patent for "thigh tumor pants" they might be positioned just right for the next 20 years if all those doomsayers are right about us carrying our phones around in our pockets. Seriously though, what sort of creature are those made for? Huh? I put it in my jeans pocket all the time. It's heavy, but it fits just fine. Message edited by author 2013-06-25 13:48:13. Hey, cool - I didn't know that it was so small. Definitely a good choice. Although, the S100 is admittedly half the price..
You know, I'd buy one today if only it had a blasted hot shoe. That diagram made me start looking at the Olympus XZ1.. If I buy a camera today I blame you. Message edited by author 2013-06-25 13:52:14. ...You know, I'd buy one today if only it had a blasted hot shoe. Too damned expensive! And still too big really, that won't go in a pocket comfortably. Want it to be teensy, and inexpensive. The Olympus XZ1 does look promising though, checking that out right now. Message edited by author 2013-06-25 13:56:46. It's the only thing I don't like about my S95. Message edited by author 2013-06-25 13:58:59.
those are fabulous pants. I can ride my horse, carry his lunch and mine, a bottle of wine for each - or wait, he doesn't drink wine so maybe a telephoto lens. damn, I forgot the camera. Another vote for the Canon S95. Looks the the price for the RX100MII will be even MORE than the RX100! That's crazy...since it's getting close to the price of the APS-C size compacts like the Sony NEX-6 and the Fuji E-1. In fact, it IS the price of the new Fuji M-1 I think. But that's just based on the prices in Japan (translated from the Yen, it comes to about $748! The RX1 may be coming down in price. Surprisingly, the list doesn't really show any of the new features, except that it's now a backlit sensor. Sounds like it will have a tilting display as rumored though...and maybe a hot shoe (if I read between the lines in some of the remarks, or they could be saying that they still don't know about the hot shoe). Release date in Japan is supposedly July 5. Proudly hosted by Sargasso Networks. Current Server Time: 04/25/2019 09:47:32 AM EDT.